But I do have to say, I’m amused that NRA has who appears to be Lars Dalseide of NRA Blog fame wear a suit even on the range. Come into he 21st century guys! Kakis and a button up or polo has been the business fashion since at least the 90s. Click on the photo to see the rest of the photos. Then they showed up for work the next day in what would be their new uniform: a white polo shirt (soon a stained white polo shirt,) and a pair of the cheapest khakis Wal Mart had that day. I also really like suits, but I won’t wear them on a regular basis unless I could figure out (and afford, for that matter) how I could get my hands on machine-washable suits. I’m mostly attracted to the multitudes of pockets, though, and find that if the suit and shirt are sufficiently loose (ie, actually tailored to fit me!) they can be very comfortable! According to Michael Bane, NSSF at one time had a program, but ended it for expense reasons. I love the suit. You can’t possibly tar that man as a hick or mall ninja/nerd wannabe. Henceforth, I decree that all male NRA reps interfacing with the media must look like my grandfather on the way to church. I would take that further: any person who open carries a gun for a protest, as an activist, or even for awareness, should wear a suit as well. On the flip side, anything that makes us look like hicks or mall ninjas should be avoided like the plague: camoflauge, t-shirts (particularly those with messages on them), and so forth. Heck, the above mentioned food-stained polo and khakis would be an Ok choice, if you insist on avoiding wearing a suit! One thing you have to understand is that business casual is the mandatory dress code for the entire Northern VA area. The place is a sea of cookie-cutter townhome developments inhabited by materialistic, soulless government employees and contractors. 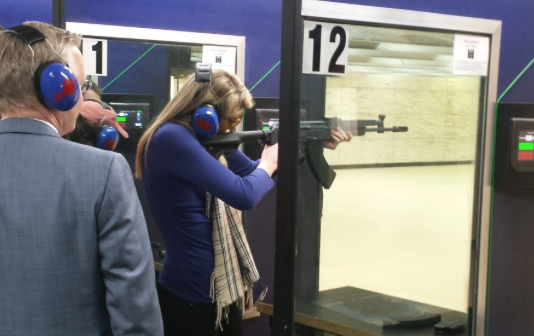 Why yes, Sebastian, you would be correct in identifying me as the man in the blue suit at the NRA Range. Happy to amuse you. The jeans and tacts are saved for days I actually get to fire on the range. Some day soon one can only hope. Um, the guy works for the N.R.A. I’m sure he can outshoot me no matter what he’s wearing. Just catching up on the blogs now. Fun post here. The photos of all the Town Hall staffers are very encouraging to see (click through to see the entire set of pics). Big props to people like Dalseide who patiently watch and encourage new shooters. Making sure a new shooter has a good first experience will determine whether shooting becomes a true hobby/interest or just a one-time thing.